Having been living in big cities throughout my life, one thing I took for granted before settling down in Calgary is the well-connected public transit system. I was so spoiled by the highly integrated transit systems that I could travel to any corner of the cities without having to drive. I didn’t realize how dependent I was on public transit until I moved to Calgary. Even after 2 years, I still miss how convenient life was in NYC, in Vancouver and, in my home town Taipei, Taiwan. 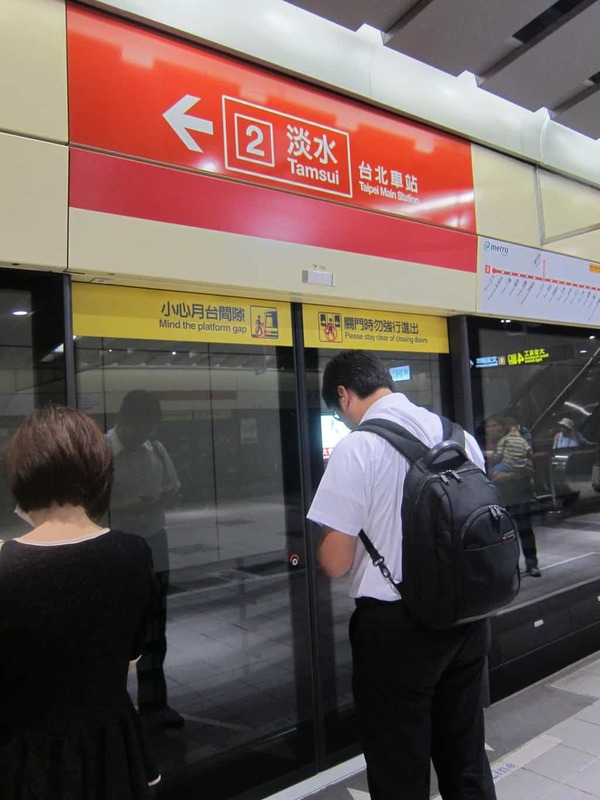 Taipei subway system is formally known as Taipei Metro, or more commonly known as MRT. If you are lost in Taiwan and want to ask Taiwanese for directions to the subway, please use the term “MRT”. Taiwanese are generally not familiar with “fancy” terms like Taipei Metro, subway or The Tube so please refrain from using them. 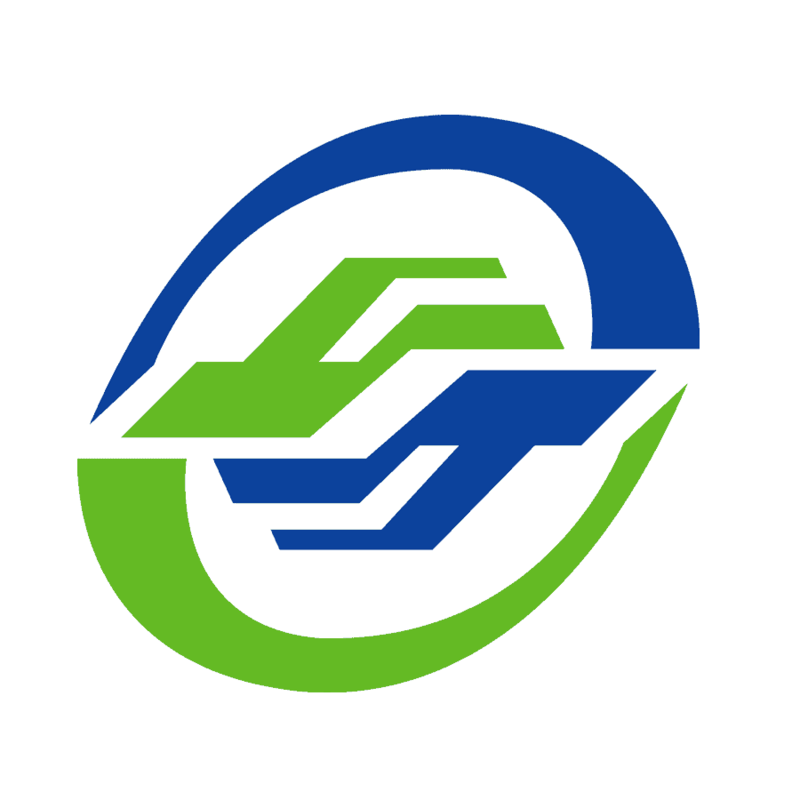 Below is the symbol for MRT. Familiarize yourself with the blue-green icon. It will be extremely helpful when you’re looking for the entrance to a MRT station. 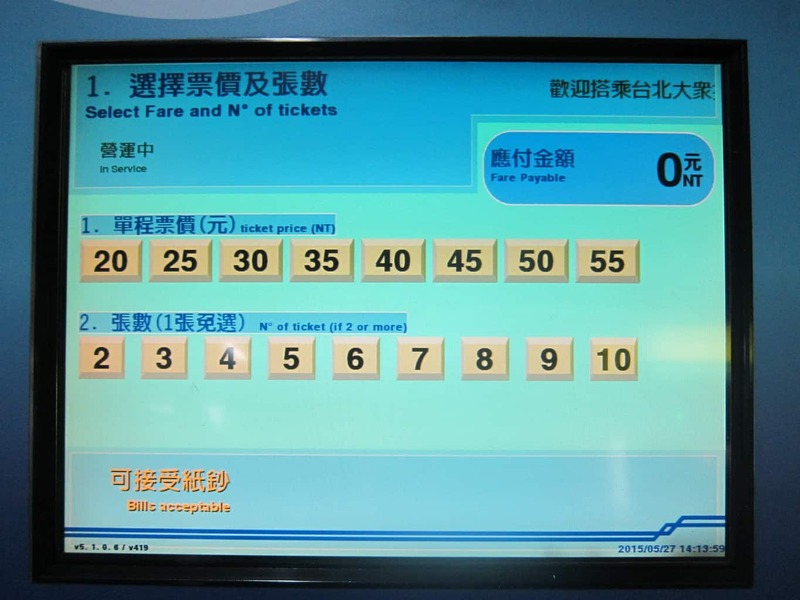 There are 5 operating routes, connecting Taipei City and New Taipei City (In case you’re wondering if that is a typo. No, these two are separate neighboring cities). Taipei Main Station is connected to the Taipei Railway Administration (TRA) and Taiwan High Speed Rail (HSR), which can take you to other parts of Taiwan. The MRT has not extended its route to Taoyuan International Airport yet, but will be completed by early 2016. The MRT system operates from 6 am to midnight daily. Unlike some subway stations in NYC and Korea, all MRT stations are cross-platform interchanges, allowing you to switch directions without changing to another platform between trains. Smoking, eating, drinking, and chewing gum are forbidden while riding on the MRT. It is also impolite to talk loudly or sit in the designated seats (marked in dark blue color) for the disabled, elderly, pregnant women and passengers with young children. While using the escalators, there is an unspoken rule to stand to the right, making way for people who are in a rush to pass you on the left. Single-Use Token: Price varies depending on the distance you plan to travel. Valid for one trip on the day of issue. Suitable if you’re only taking the MRT once or twice max. One Day Pass: NT$150. Valid for unlimited travel on the MRT from first use until the end of service in a single day. Suitable if you’re only staying for one day and taking the MRT at least 5 times (assuming each trip costs $30 on average). 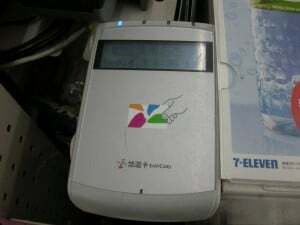 24-hr Taipei Metro Pass: NT$180. Valid for unlimited travel on the MRT within 24 hours from the first use. Suitable if you’re only staying for one day and taking the MRT at least 6 times (assuming each trip costs $30 on average). EasyCard: NT$100 deposit. An additional value must be added to the card before use. This is the most common type of metro card. We strongly recommend getting one if you’re visiting Taipei for a few days. It gives 20% discount on each trip on the MRT. When transfer from MRT to bus or vice versa within one hour, you will receive a NT$ 8 discount. 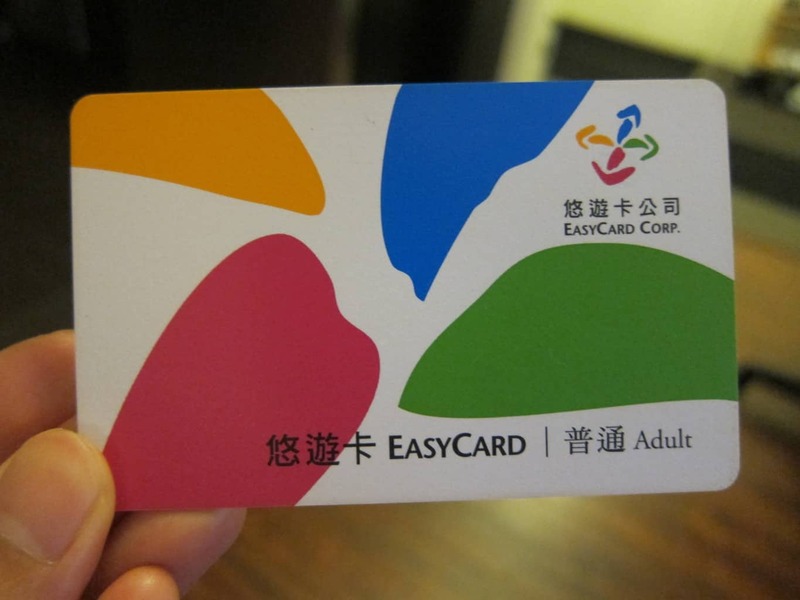 EasyCard can also be used to buy TRA or HSR tickets, pay for taxi rides, pay for entrance fee at attraction sites, make purchase at convenient stores and many more! Just check for or logo if you’re not sure if the outlet accepts EasyCard payment. 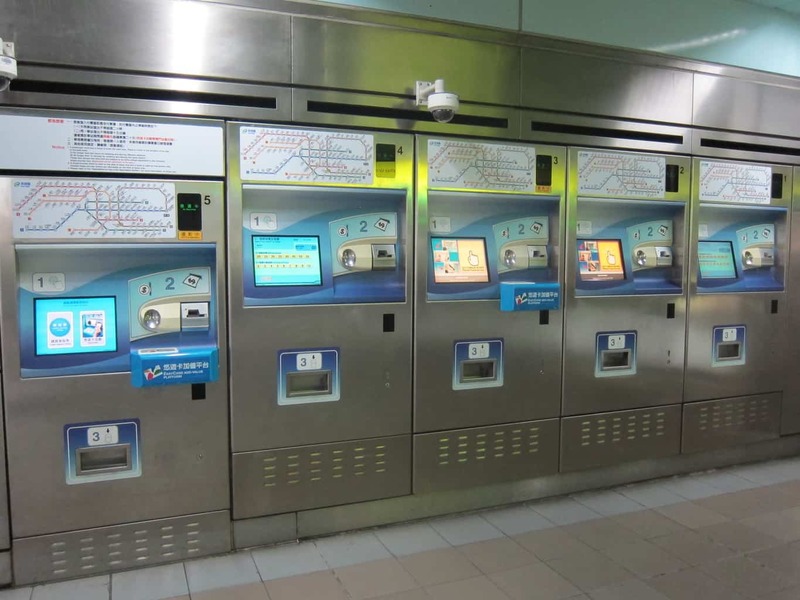 Single-Use Token can be purchased from ticket vending machines at MRT stations. Just follow through the directions on the screen and the token(s) will be dispensed for your use. One Day Pass & 24-hr Taipei Metro Pass are available at the information counters at all MRT stations. 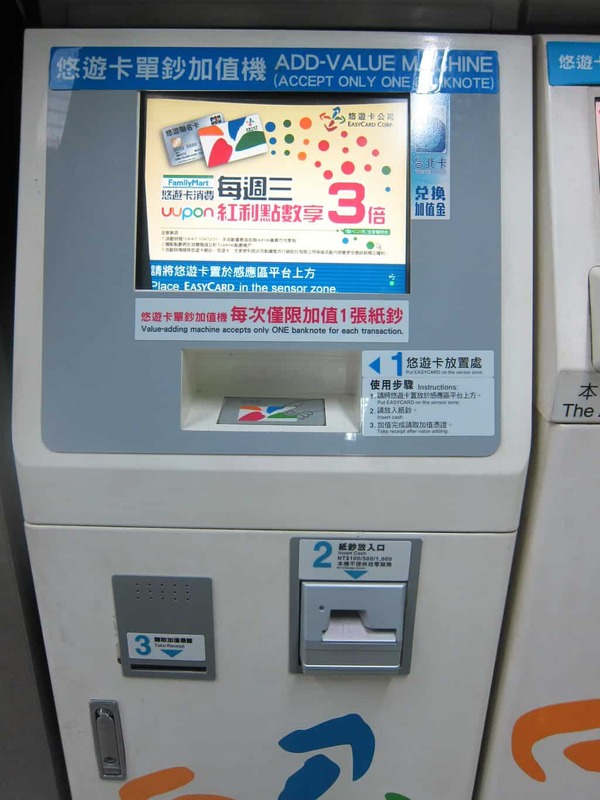 EasyCard can be purchased from the convenient stores (including 7-11, Family Mart, OK, Hi-Life) and EasyCard Vending/Add-Value Machine at MRT stations. 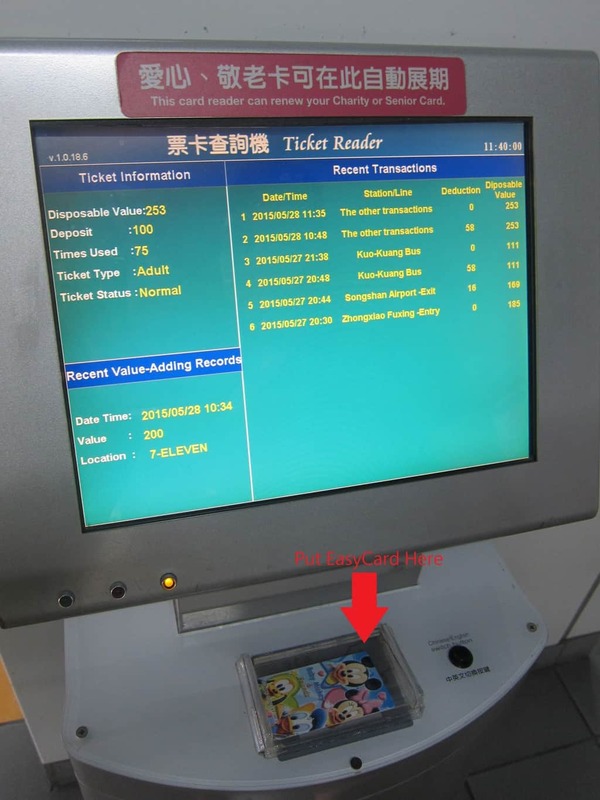 Keep in mind that the card itself costs NT$100, you need to top-up the card before you can ride the MRT! Where to top up EasyCard? At the Add-Value Machine at MRT stations. At convenient stores (including 7-11, Family Mart, OK, Hi-Life). You can top up your card at the cashier counter. Tell the store employee how much you would like to top up and put your card on the sensor machine. The card can then be removed once value has been added. At the MRT information counters. How to check the balance on EasyCard? 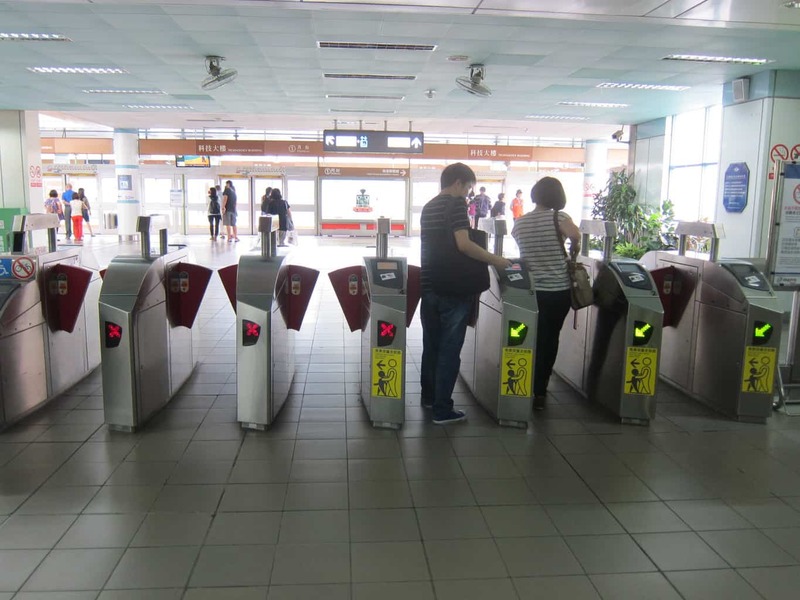 The easiest way to check your balance is using the Ticket Reader Machine, usually located near the information counters at MRT stations. Simply put your card on top of the sensor and you can find details including recent transactions and balance on the card. Now you have your token/pass/EasyCard, let’s go on a ride! How to ride the MRT? First, go through the turnstile by tapping your card/token over the sensor. Before you do that, make sure you are at the turnstile that has a green arrow. Turnstiles with a red ‘X’ are reserved for passengers coming from the opposite direction. Then, follow the signs to find the platform for the route you’re taking. In general, pay attention to the name of the line and its associating color. Once you’re at the platform, confirm the train is driving towards the correct direction by checking the terminal station of the line. For example, in the picture below, the platform is for Wenhu Line (Brown). 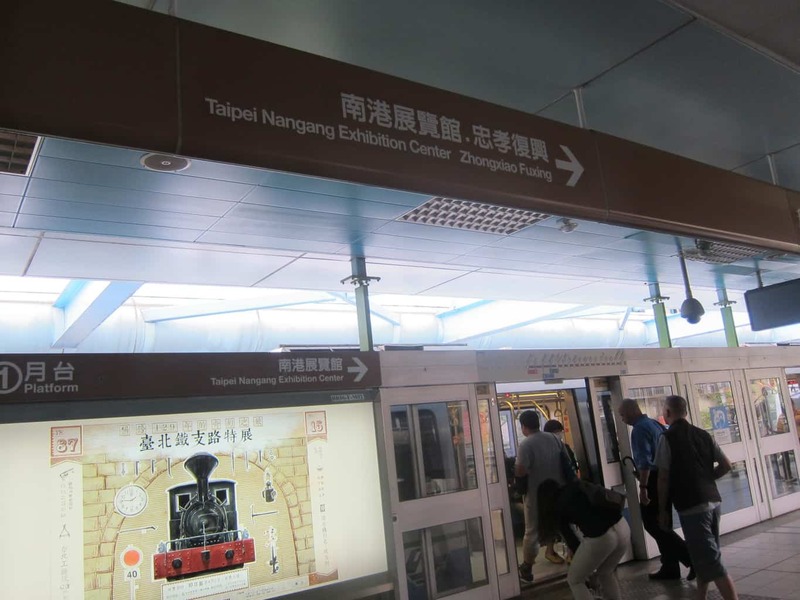 The arrow is showing the direction in which the train is traveling and the wording clarifies that it will travel towards Zhongxiao Fuxing and making the final stop at Taipei Nangang Exhibition Center. Easy peasy? Let’s practice once more. In the picture below, we are at Taipei Main Station. The platform is for Tamsui Line (Red) going towards Tamsui. However, the following picture shows that on the opposite side of the very same platform, the Tamsui Line (Red) is going towards Xiangshan. Got it? 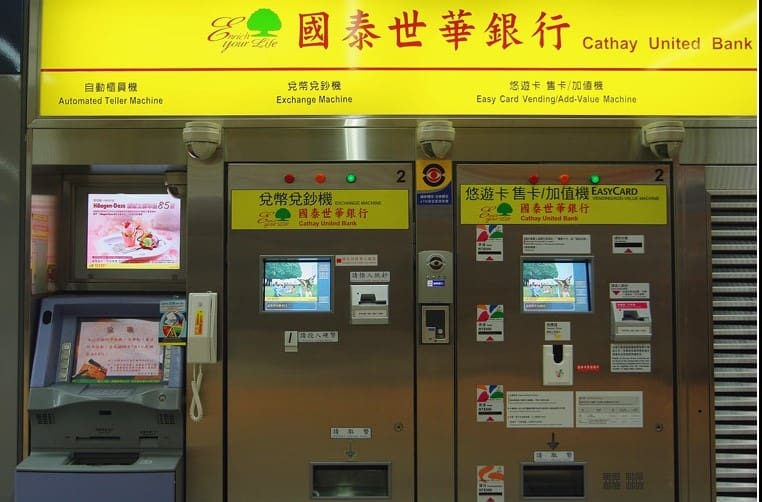 Lastly, if you’re sure you won’t be visiting Taiwan anytime soon after this trip, you can consider returning the card for a refund of the remaining value on the card (including deposit). This can be done at the information counter. 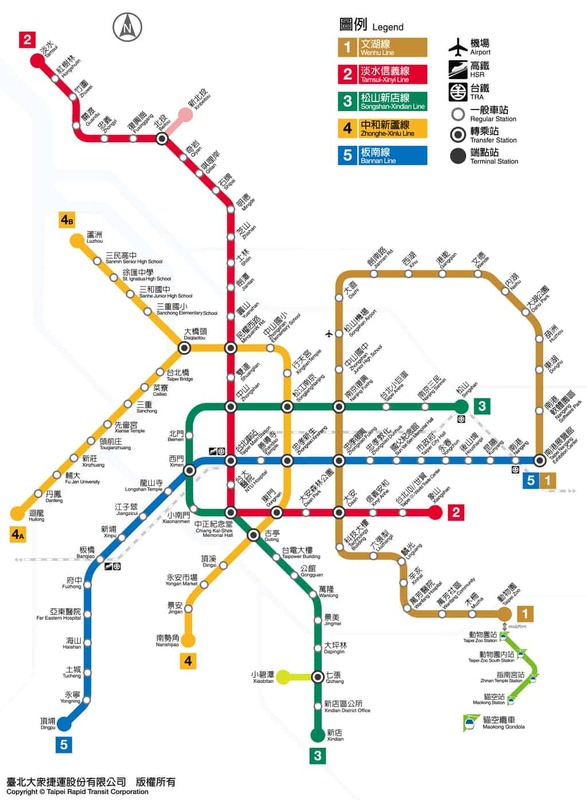 As a visitor to Taipei many many times over the last ~15 years, it has been interetsing to see the expansion of the MRT network. 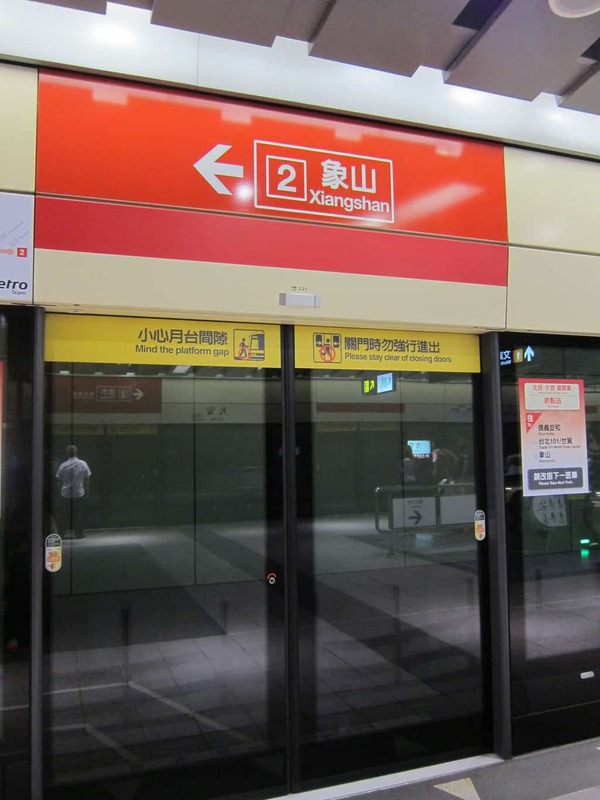 Since this article the Aiport (Taoyuan – the main airport) line has opened. Just took it. Great. Just make sure you take the express trains (same cost they just miss quite a few stops). Also note that the stations are also now numbered for ease of travel for international travelers. Just note the colour of the line (eg. Red) and the station number then you get the station ID (eg. R10). Very simple. Great system – Toronto and Montreal should be embarrased in creating their subway systems in the 60s or 70s and basically doing very little since. Taipei MRT only started ~1996! Questions, can my bf and I share an EasyCard or would we have to get separate cards? Hi, Jenny! You will need to get separate EasyCards if you’re traveling together because the card will track where you check in and check out to calculate the fare. That means you won’t be able to check in/out twice in a roll. if i am about to leave. shall u surrender my one day pass? will they refund me money? if not i’ll keep it as a souvenir. Hi! I don’t think you can refund your one day pass. But I’m sure you can redeem your EasyCard to get back the deposit. Hope this helps! Hi!! I have a easycard and I forgot pasa the card, when I try to return the card dont pass… you know what can I do? Hi Adriana, sorry for what happened. I would suggest talking to the staff at the MRT station directly to resolve the issue.